This scenic hiking trail is in the Mont Rochelle Nature Reserve, just outside the town of Franschoek, in the Western Cape. While the town is known for its wine and it’s gourmet restaurants, the surrounding mountains offer some very accessible hiking routes, ranging from a short two hour excursion, to a full days hiking such as this one. The destination is Perdekop (Horse Peak), from where there is a 360 degree panoramic view. While the walk up is fairly easy, the steep route down is challenging on the knees. After last week’s rain, Sunday was one of those wonderful, sunny, Cape winter days. Nevertheless it was a cold start with a breeze coming off the snowy mountains not far away. Once we got walking the beanies and fleeces soon came off. 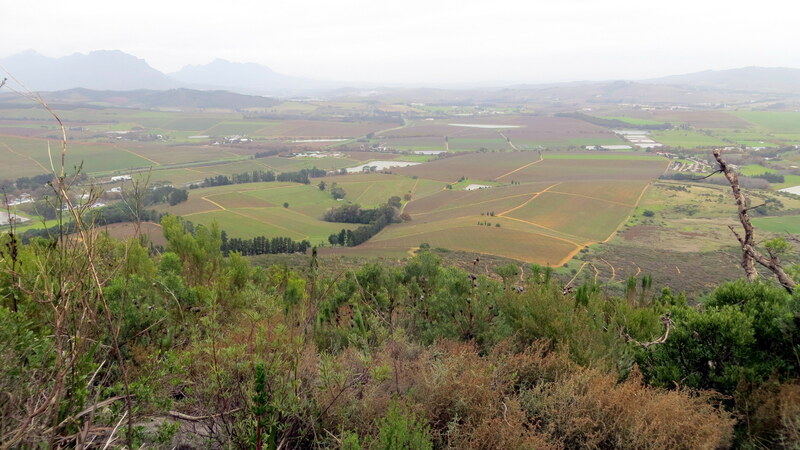 The first part of the hike is a fairly easy undulating hike, to Uitkyk view point. There was plenty of opportunity to stop to take photographs of the views back down the valley to the Theewaterskloof Dam. We stopped for tea at the view point, enjoying the view over the Wemmershoek dam. The trek up from there to Perdekop is slightly more strenuous with the destination hidden from view for most of the route. Once it came in to view it seemed to get further away as we got closer. We made it there by lunch time and enjoyed the amazing 360 degree views all the way to Cape Town and Table Mountain in the distance and Worcester in the opposite direction. The circular path leads back down the valley to the start. Although shorter, this is the most strenuous part of the hike, with the path being almost entirely downhill and very steep in places. By the end most of the party knew where their knees were and there were a few sore feet and thighs. All was worth it though and certainly rates as another of the most scenic hikes in our beautiful Cape. It was great to stop for a quick cup of coffee in Franschhoek afterwards. We will have to make a plan to come back for wine tasting on another occasion. 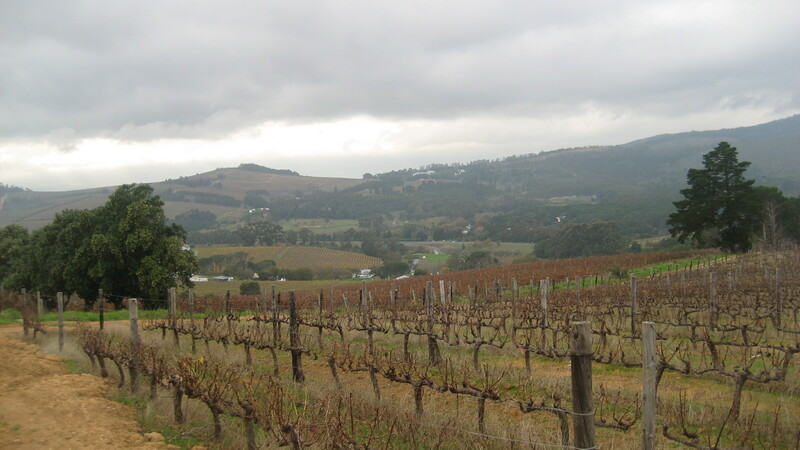 The Vineyard Trail is a circular route of approximately 11km. 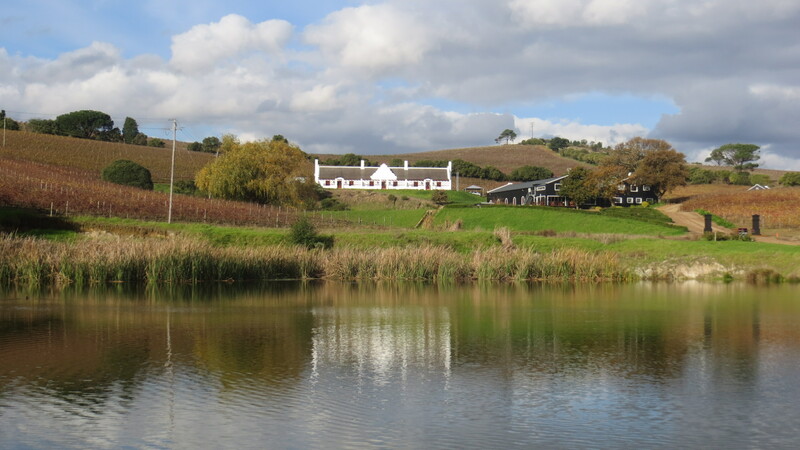 It starts and finishes at the Devon Valley Hotel and meanders through vineyards and the wine farm of the area. Although the paths are clear, the signposting is confusing in places and a wrong turn or missed marker can take hikers off on the wrong route. A map is provided at the hotel, although it is important to make sure you are given the correct one, as one of the alternative trails (green route on the map) is closed. Not all the hotel staff are properly briefed on the alternatives. The trail starts from the parking area behind the hotel, follow the tarred exit road to the gate and turn left up the hill. Head up the tar road, to where it becomes a dirt track, passing buildings on your right, to a line of pine trees. At the pine trees there is a trail marker, turn right down the hill, keeping the vineyards on your right. 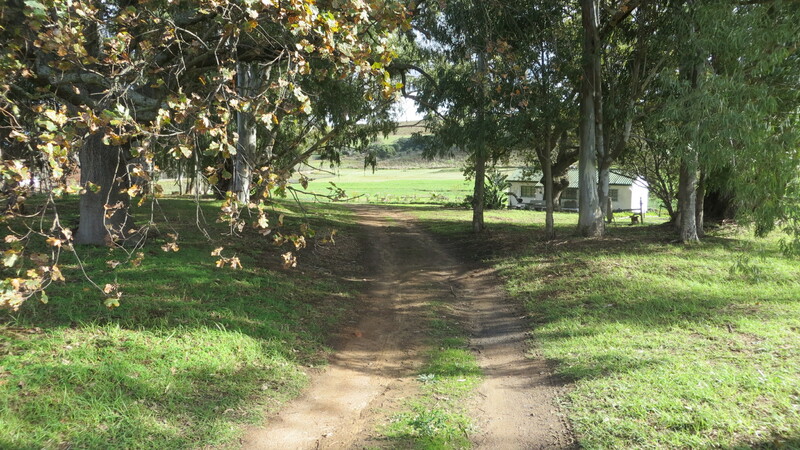 At the bottom of the hill the path does a right turn before you pass between two posts on your left and on to a short tar road opposite the Protea Heights flower farm. Note: At this stage the trail used to go up to the left. 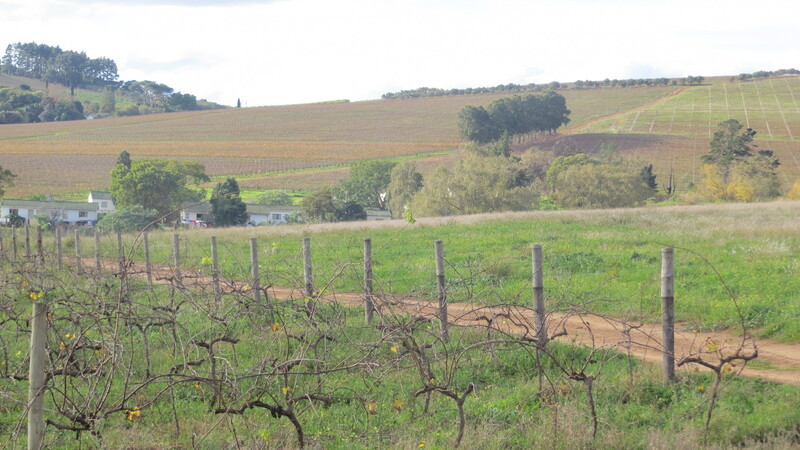 With the Protea Heights farm being fenced in, it now goes to the right. It can be confusing, as the old direction marker has not been removed and the new one is easy to miss. Either follow this path until it comes out on a T-junction with a farm track – there is no sign here – turn left up the hill until you come to the electric fence border of Protea Heights. Here you will see a very confusing sign with arrows pointing in different directions. 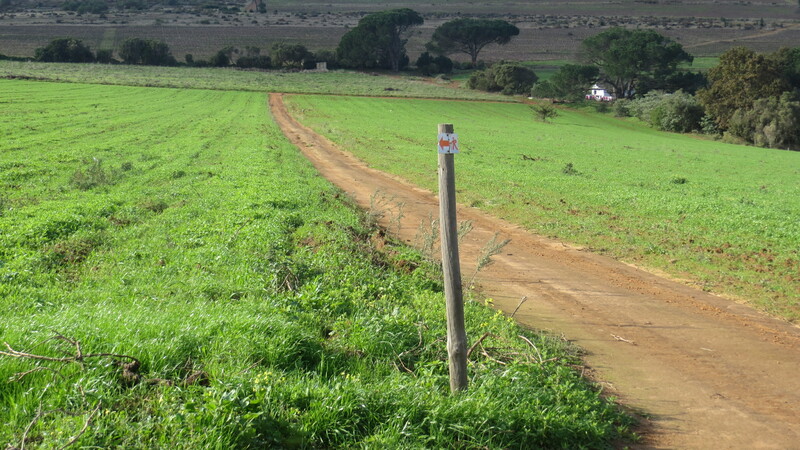 Turn left and follow the farm track until you come to the electric fence border of Protea Heights and turn right, following the track along the fence until you come to the confusing sign pointing in both directions. Follow the track along the electric fence until there is a fork. Follow the sign along the left hand fork. From here on most of the signage is fairly clear, although it is easy to miss a direction marker. 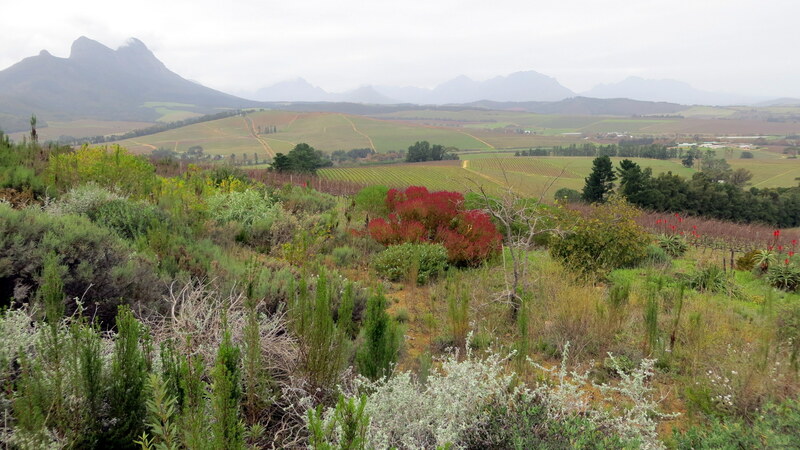 Shortly after this the track descends gently, with views of the outskirts of Stellenbosch and Simonsberg Mountain. As the track descends, there is radio mast is on the right at the highest point on the trail. Half way down the valley there is a marker showing the track that turns right up towards the FM radio mast at the highest point. After passing the mast the track descends once more with a small farm dam in the valley on the right. Before a row of pine trees follow the marker to the left and then right to where there is a marker on one of the trees. Follow this row of trees to the left along the track until there is gap in a group of low trees. 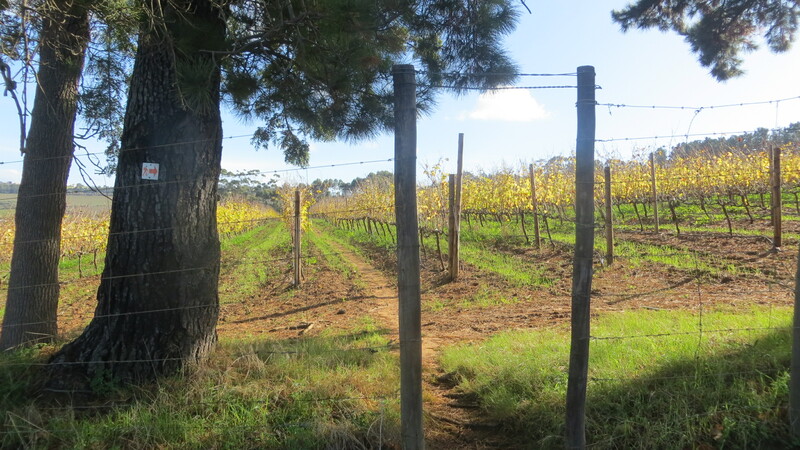 There are wine cellars down in the valley to the right and the trail is well marked here with the track twisting through the vineyards, before coming to an old concrete water tank structure and a large stone pine, where the path turns right and then left passed the farm labourers cottages. 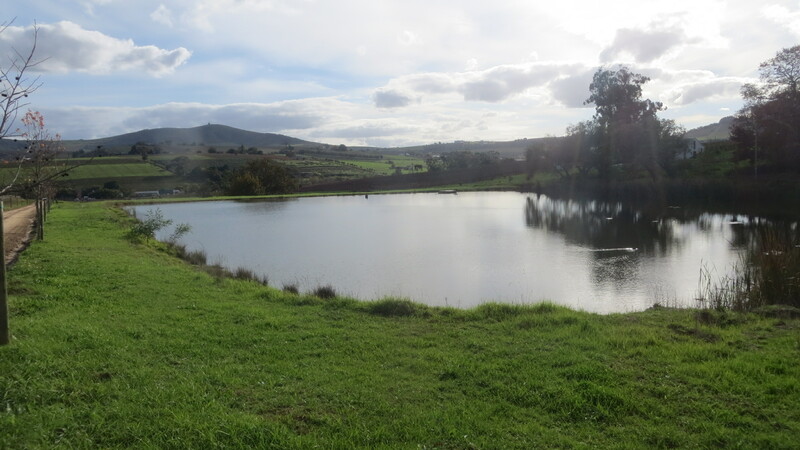 This track comes out at Middlevlei Wine Estate, which is a good place to stop for a rest, wine tasting and their regular ‘Boere Braai’ lunch (this should be booked before departure to avoid disappointment). After leaving the farm along the paved exit road, past the large farm dam, the track leads past a small cottage and towards a smaller dam. 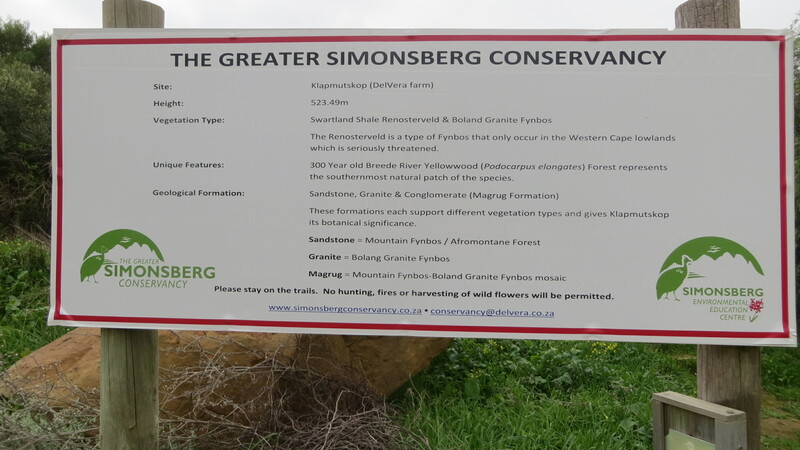 This is a good place for a picnic lunch if hikers do not want to take advantage of the Middlevlei offerings. The path continues between the small and large dam, just below the main farm homestead. This is not clearly marked but it is easy to pick up the track through the vineyards on the opposite side by following the track close to the dam. The track through the vineyards is clearly marked after this. Follow the track to a fenced off area surrounded by security wire, before turning right down the hill. 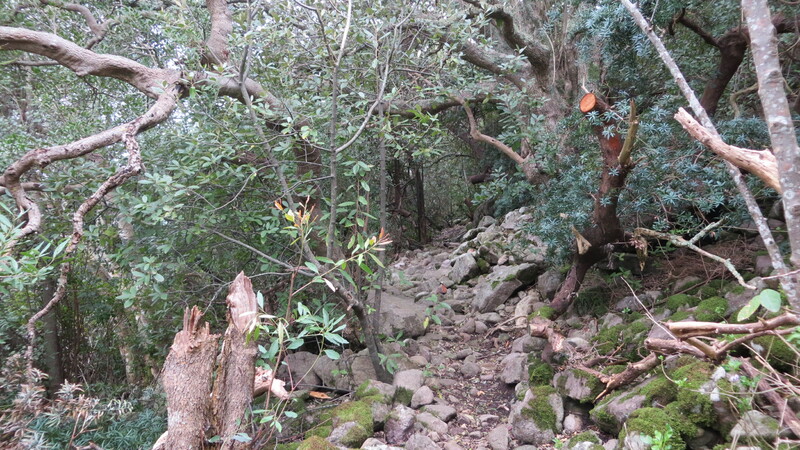 This track is very clear and eventually comes out at the Aaldering Estate. 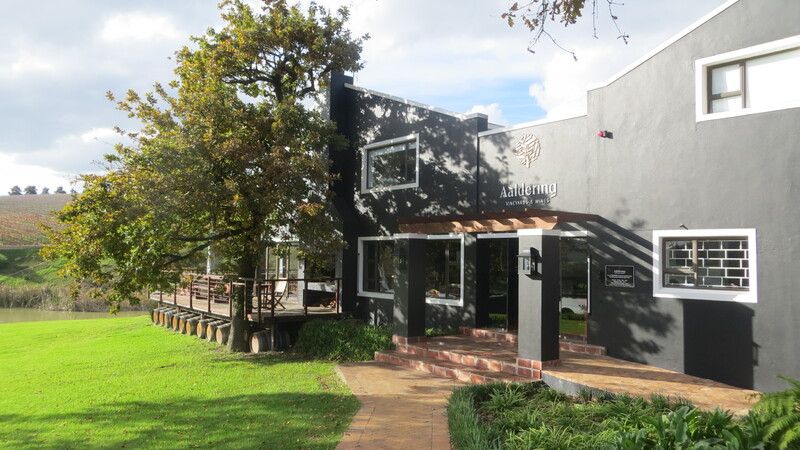 If you are interested in wine tasting this is also a great stop, with an interesting Pinotage Blanc that is really worth tasting, among others. After leaving the estate via the main entrance, the road passes a small dam with the path turning off over the dam wall towards some cottages. The sign showing the way is in place, but easy to miss if you are distracted. After the passing the cottages head down a paved track between a row of olive trees and the vineyards. Half way down this path is a turn off on to a track between the vineyards. 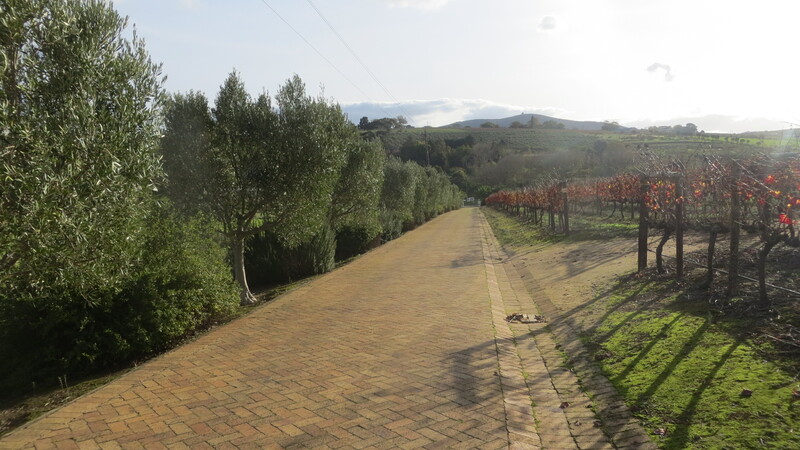 There are various twist and turns but the signage is all in place and the path clear up to the end of the farm track where it leaves the vineyards. Follow the sign to the left before passing a group of cottages, where you are likely to be greeted by friendly wave and greeting by the inhabitants and excited children. Pass by two large green water tanks and then left again on to a farm track leading behind the cottages and the farm buildings. Now you should be able to see the track that leads up to the fenced Protea Heights property. 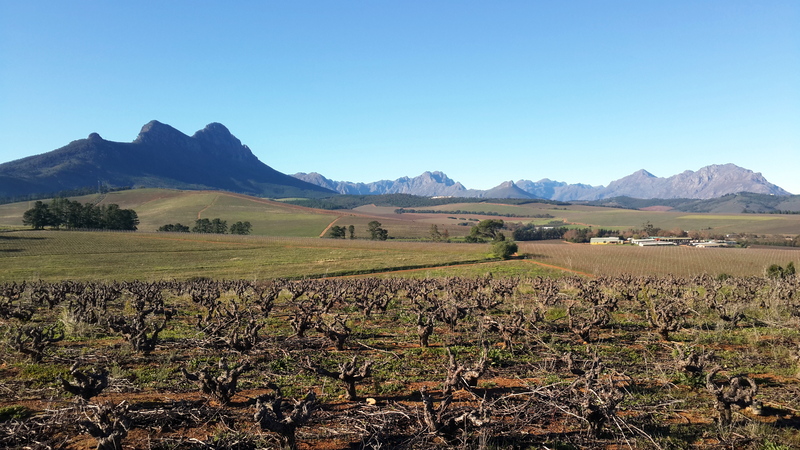 Shortly after this it is a back on familiar territory and you cross the vineyards back to the confusing ‘backwards / forwards’ sign and then follow the farm track to tar road and that passes the Protea Heights entrance. Pass through the two posts the left and the return route back to the hotel follows the same track as the as the start. 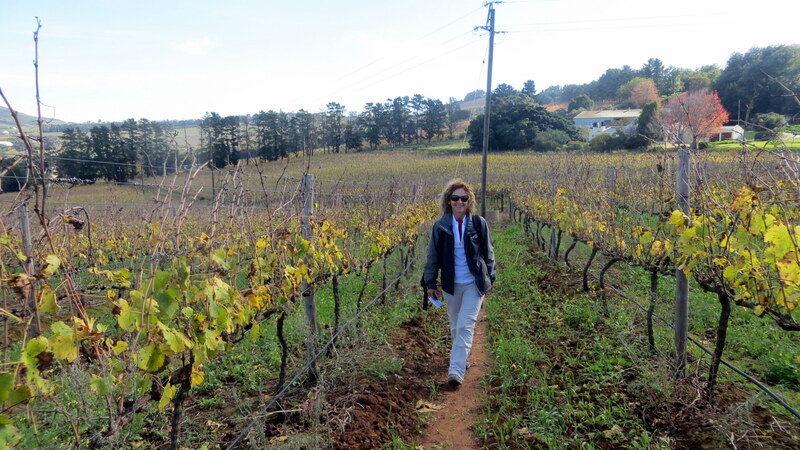 Walking in Constantia – sensational wine walk route explored. 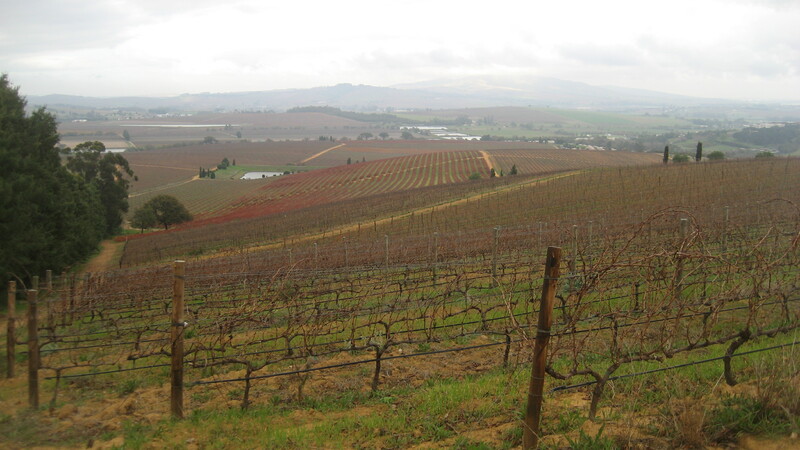 This was not planned as a walk in the Winelands, but when you look at the views from high above the Constantia Valley and the experience wine tasting at Groot Constantia at the end, this has to rate up there with the best in the world. Saturday was a stunning early winters day in Cape Town, ideal hiking weather. 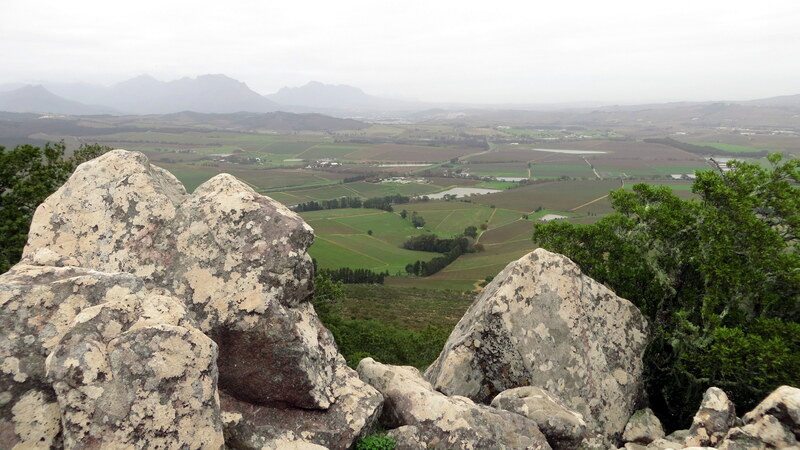 This, plus the planned route up to Vlakkenberg Peak and the end point in Groot Constantia attracted a big group of Meridian Hiking Club members, plus visitors from Germany (Thomas & Katrina) and the USA (Trika & Kim). The short trek up from Constantia Nek up to Vlakkenberg Nek needs a bit of effort but once into the natural fynbos vegetation higher up the slope it is a real pleasure. The sound of grassbirds, sunbirds and sugarbirds is endless. After the rain and mist of the previous two days, the birds were ready for a bit of sun. Less than an hour up to Vlakkenberg Nek and the one of the three rocky peaks for a tea break and the view overlooking Hout Bay – what a treat. There is a bit of scrambling up there for the more adventurous, but you need to know where to go. Back to the main path to join the route to Vlakkenberg Peak and the traditional group photocall. The fairly level section from there to join the path down Vlakkenberg Ridge has some stunning Proteas and a display of flowers & fynbos. The real treat (and surprise for those who have not done this route before) is the view over the Constantia wine farms from the top and forest of Silvertrees on the way down. It is a fairly steep path down, a bit tough on the knees but firm underfoot and well maintained. Once in the Silvertree forest it is a real pleasure. 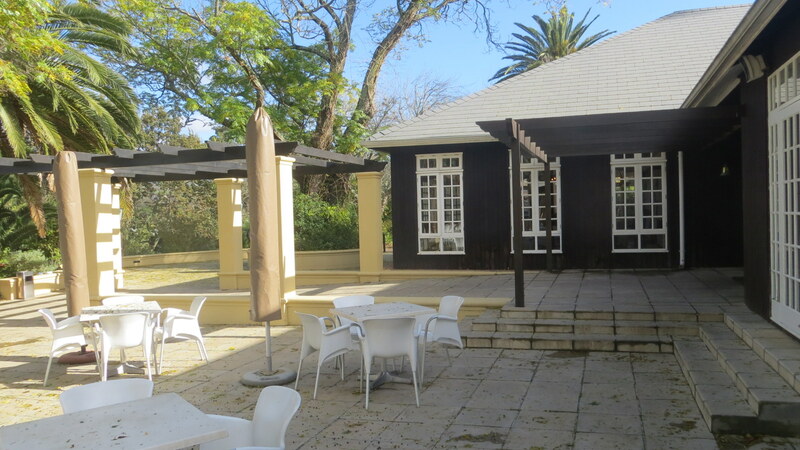 Back into Groot Constantia it is short walk past the historic swimming pool and on to Simon’s Restaurant for a drink and a snack. Wine tasting is available and a cellar tour is an option. For those with an interest in history there is an excellent museum in the old manor house. Wow what a wine walk!! 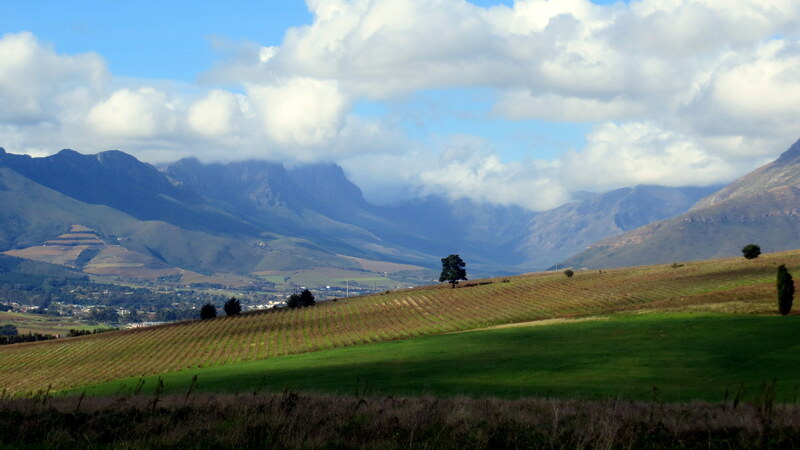 What could be better than a day out in the Stellenbosch Winelands? 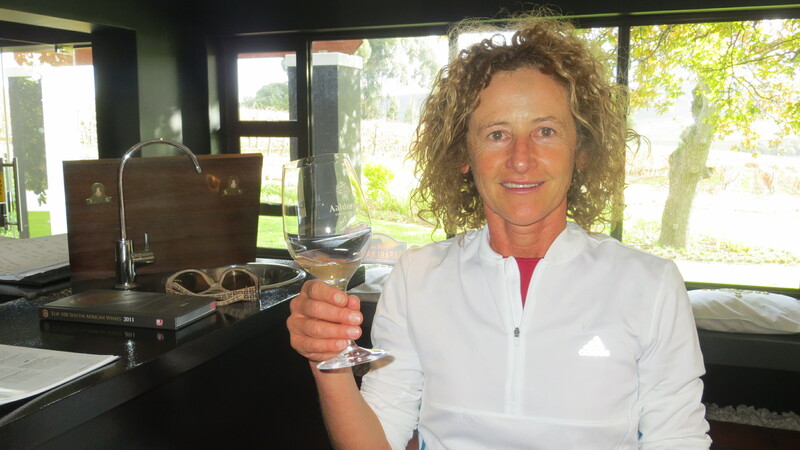 This time not just sitting in a vehicle driving from one tasting to another, but walking through the vineyards, interacting with the winemakers and workers, admiring scenery and getting close to both the cultivated and natural environment. 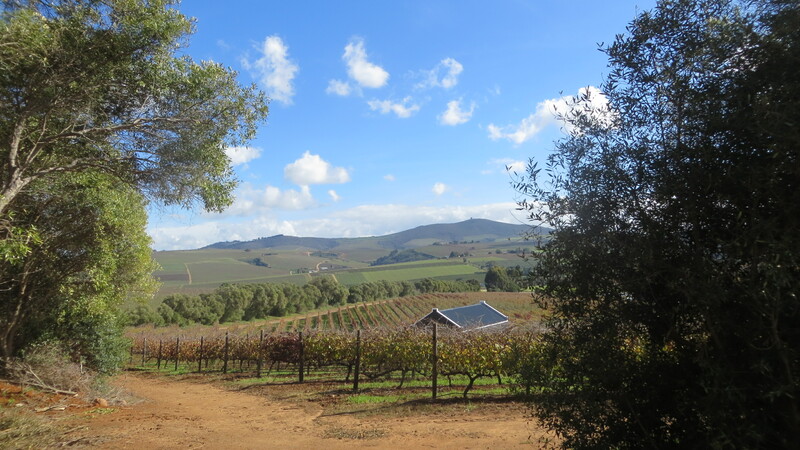 Guided by knowledgeable local wine guide, Annelee Steyn, this was a day to remember. 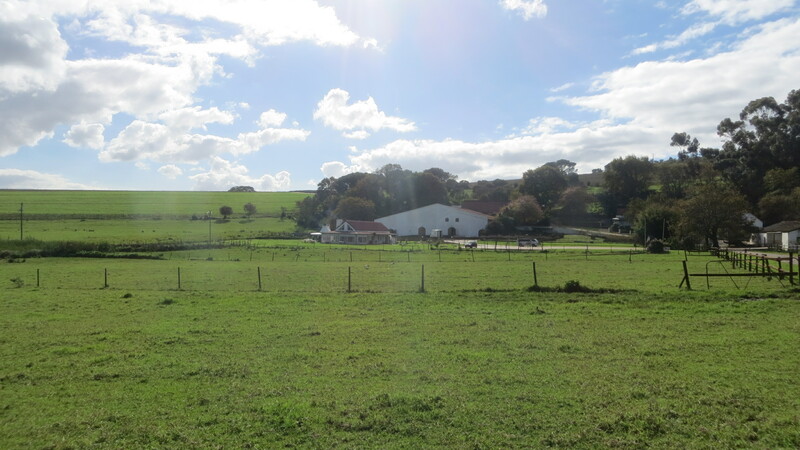 Starting on the popular Delvera Estate, this is going to be part of a three day / two night, ‘slackpacker’ style hiking trail. Not only will you walk through the vineyards and meet the locals, but you will sample a wide variety of wines derived from the vineyards you have walked through, taste local cuisine and get some good exercise – reasonably easy walking, but with a level of fitness required for full enjoyment. There are opportunities to sample food at a few different venues, served by the most delightfully hospitable waitresses and restaurant supervisors. There was an amazing impression that the managers were there in the background but that they preferred and trusted the staff to interact with customers. This was not unique to one establishment, but was a trend found at all the places that we visited. Depending on the season, wine making activities can be followed and experienced, pruning, picking, crushing and possibly blending your own. Watch his space – there is more to come. Now THIS is the way to experience the outdoors! ……….. and if you don’t have the time or the inclination to hike the overnight trails we can guide you on some amazing day walks in most parts of Table Mountain and the Cape Peninsula. For more information complete the TRAIL ENQUIRY FORM or e-mail info@slackpackersa.co.za or read on. Slackpacker SA offers multi-day trails that last from two to six days. Overnight stops are in top-notch camps or lodges set in beautiful surroundings. You’ll have your own qualified guide with all the specialist knowledge required. You’ll be shuttled to and from the beginning and end-points and your luggage will be transferred between overnight venues. Best of all, you’ll be served a home-cooked meal and a choice of drinks at the end of the day’s trek. After an active day and good company you will sleep comfortably in serviced accommodation. For those with less time, there are day hikes on Table Mountain and in the Cape Point Nature Reserve, as well as walking-tours in the Cape Winelands. Based in Cape Town, in the Western Cape, we operate within the Table Mountain National Park – stretching from the city centre to Cape Point, 60 km away – as well as in the Cape Winelands, Garden Route, Overberg and West Coast. We also partner with trails on the Wild Coast, in the KwaZulu Natal Drakensberg and other parts of South Africa. But wherever we take you, it’ll be in true Slackpacker SA style. Slackpacker SA can also take care of the tour arrangements for your entire visit – your itinerary, accommodation, airport shuttles, visits to interesting venues and attractions, wine tours and other outdoor activities. You could join one of our pre-arranged tours, or we could create a private itinerary just for you. Whether you join us as individuals, couples or groups, for a special event or as a team-building group for a corporate event, rather focus on the serious business of having a good time – and let us take care of the rest. Imagine waking up on top of a mountain in a Natural World Heritage Site, in the middle of a vibrant city!